Winter has arrived with a light THUD! It’s abnormally warm in New York City, but don’t be fooled. This is the same City that had a snow storm the weekend before Halloween – all tricks, no treats! The weather is cool, but things can change in almost an instant. For that reason, I never leave home without my gloves. 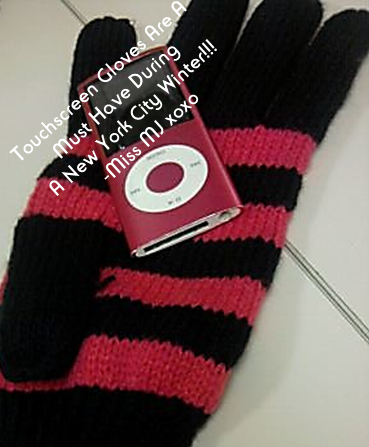 My gloves and iPod are 2 of about 6 essential items I never leave home without. There is nothing worst than waiting for the train on an elevated platform, while deciding to pull out my iPod and having to take off my gloves to merely navigate through my playlists. That is why touchscreen gloves are essential for touchscreen gadget fanatics. If you have any type of touchscreen gadget and you don’t want to sacrifice the comfort and warmth of your fingers during a brutal New York City winter, touchscreen gloves are an indispensable purchase. Parts of the index finger and thumb of the gloves are embroidered with conductive thread that conveys an electrical impulse to your touchscreen device. Technology is amazing, and so are these gloves. I recently purchased a simple pair for $10.00 at a Strawberry store in Midtown, Manhattan. Prices can go up to as much as $50.00 depending on the style, brand, and threading. Whatever your price limit, stay in style and tech savvy with a pair of touchscreen gloves!